Hard flooring looks absolutely great but, from time to time, you’ll need to sand it down and give it some real TLC. Sanding floors the right way is really not easy. Contrary to what you’re led to believe, it takes a reasonable amount of skill and it’s not something to launch into after watching a 3 minute YouTube video or flicking quickly through a couple of forums. How To Sand a Floor is a great site stuffed with resources, both free and paid, to guide you every step of the way when it comes to giving your wooden floors the finish they deserve. Who’s the guy selling this bumper guide and why should you trust him? Ben Osborne is a professional floor sander. He runs his own floor sanding company and also spends a great deal of time teaching others to successfully do the same. The amount of free tips and advice he dispenses on his site outflanks many paid products. That alone is enough to instill our confidence in him. He continually states that his product is not a magic bullet. His intention is to help you master a skill you can use over the course of a lifetime. With over a decade perfecting the art, investing just $37 in The Complete Guide to Sanding and Finishing Wood Floors is a great way for you to take advantage of all that know-how and put it into practice yourself. 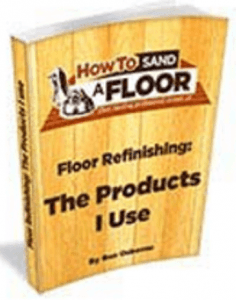 In his 30-minute presentation, Ben Osborne walks you through the awesome blueprint he offers to help you get a professional grade finish when you’re sanding your floors. He’s quite upfront about the fact that it’s not quick fix but requires a little time and effort on your part. If you want to watch the video with the ability to fast-forward and rewind, check out the video here. The video includes testimonials from satisfied customers along with the free tips and advice Ben is famous for graciously handing out. Before we break down the guide itself, how about the freebies you can find on the website? The first giveaway is Floor Refinishing: The Products I Use. You can get the superb free e-book right here. All you need to do is supply your email address and you’ll get a concise, downloadable guide to the very best products to help you sand and finish your floor the right way. If you’re prepared to put in at least a little time and energy to finding out more about sanding, you’re likely to experience far better results. Even if you’re not interested in signing up for the premium version of The Complete Guide to Sanding and Refinishing Wood Floors, there’s plenty of useful, actionable information here on Ben’s site for you. The comprehensive blog has a wealth of informative articles covering everything from painting your floors to hiring equipment. There’s no hard sell, just useful tips and tricks to make your life easier. For a one-off payment of only $37, you’ll get a fantastic downloadable book packed full of tips learned the hard way. As with the vast majority of information products these days, you’ll be fully protected with a money back guarantee. You can simply claim a full refund whatever your reason if you’re not delighted with your purchase by emailing Ben directly. Sanding floors is a lot more difficult than you might imagine. That said, with the right guidance, it’s absolutely something you can take on yourself. If you don’t want in to call in the contractors but you don’t fancy bungling around in the dark or endlessly scouring for suspect information, road test The Complete Guide to Sanding and Refinishing Wood Floors today. You’ve got literally nothing to lose and potentially silky smooth flooring to gain!